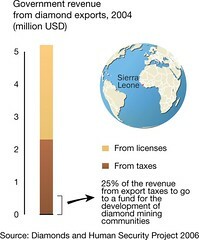 The government of Sierra Leone saw a total of USD 5.2 million (2004) in revenues from diamond related activities. 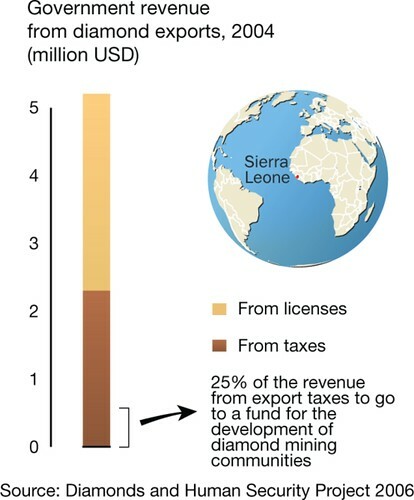 This comes in the form of mining, dealer and export license fees and from export taxes. To feed some of the revenues back to poor communities, the Diamond Areas Community Development Fund (DACDF) has been set up, with an annual commitment of 25% of revenue from export taxes. The intention is that this money will be dedicated to community infrastructure, agricultural improvements and training, but the actual distribution of the funds have been problematic.